As the tallest animals to cross this planet’s surface, giraffes are surprisingly vulnerable to predators. Adult giraffes' size intimidates many potential predators, so younger giraffes are more vulnerable. The giraffe’s most powerful protective asset is a powerful kick it gives with its front feet, with a force strong enough to kill a lion. Nature gave the giraffe several nonviolent characteristics that help it survive. The giraffe’s height is important to its survival. Besides making a giraffe appear to predators too big to tackle, the animal's height, combined with its extremely acute long-range vision, enables it to detect predators from great distances. They have long legs as well as necks, and the unique way they run -- both legs on each side leave the ground at the same time -- gives giraffes an impressively long stride, allowing them to cover long distances quickly and without expending much energy. Giraffes typically have one or two horns on the tops of their heads. These don’t grow very big and aren’t sharp, but they do protect their heads in the occasional headbutting that occur among males. They have the ability to completely close their nostrils to keep sand and dust out during African dust storms. Their long tongues are not only long enough to reach the leaves they need but are also very tough, allowing them to eat thorns as well. They use their tongues to remove parasites from their faces, too. Giraffes can go days at a time without drinking water. This matters to the giraffe's survival in a way other than hydration: Because giraffes must position their bodies in positions of vulnerability when they drink, they don’t do it often. If they sense any bit of danger, they’ll wait. Giraffes get water from the moisture contained in the leaves they eat and by consuming several gallons at a time when they do drink. When you’re as tall as a giraffe, you tend to stick out. 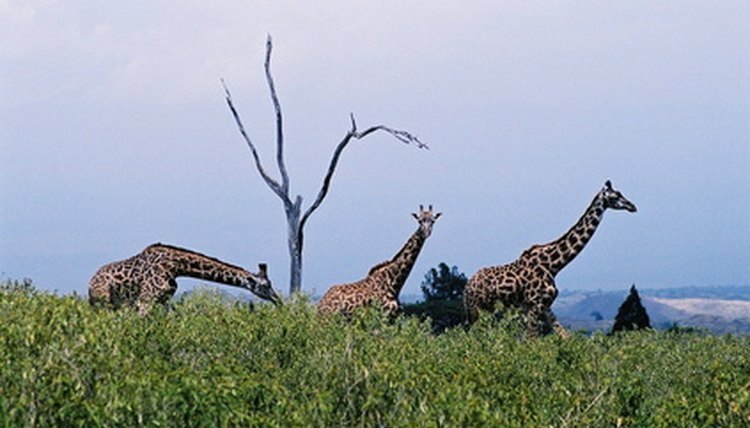 But the giraffe's unique blotchy coloring camouflages the herbivore while it eats leaves off trees. Females travel together, along with young giraffes, which are especially vulnerable. Meanwhile, several species of birds provide a form of protection to giraffes by perching on them and picking at parasites that could potentially weaken and sicken giraffe hosts.